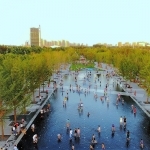 Gu’an Central Park is a 205,000m2 park located in the center of Gu’an New Town, a satellite town of Beijing. The clients request for this project was to design a park that served the surrounding communities and accommodated the current population and the fast growing future population. 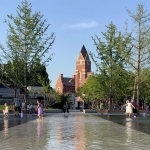 Recognizing residents’ needs for local community interaction and recreation, the designers created a new city landmark with great care and intention. 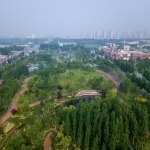 Gu’an Central Park has created a completely green eco-system within the city and a park that responds sensitively, and in a contemporary manner, to the needs of the community. The concept was to create a large green space in the middle of the urban core and to arrange activity zones conveniently placed along each side of the street. The goal was to keep the integrity and character of the local area, meet the needs of the public, and focus on sustainability and environmental factors. The park and gardens were created to attract the surrounding community’s residents to an engaging and productive environment. The client wanted a modern park with fitness facilities, water feature,an educational and sustainability focus, and an aesthetic which contributed to the city’s vibrance. 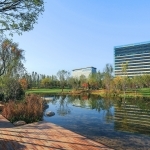 The location of Gu’an Central Park offers a natural respite in the midst of a growing urban setting. 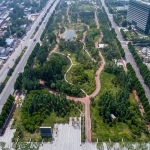 It is now the central park, and primary gathering place for residents of Gu’an. 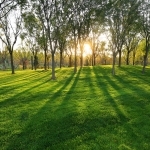 The park is conveniently located adjacent to residential housing developments and mix-use community districts. 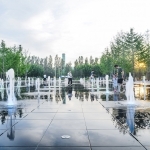 The park’s numerous recreational facilities, water features, and gently sloped green expanses, draw locals and visitors to a community-centered open space. An important design feature of the park is its many entrances and exits from the surrounding streets. 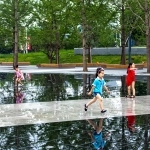 Where most parks in china restrict access, this park was designed as an easily accessible community park. One of the design obstacles which the client outlined was a concealed underground carpark which limited construction and plantation above it.To resolve two issues at once, the designers placed the water feature here, resulting in a large reflecting pool which is a prominent feature at the west end of the park. The pool is now a popular destination for visitors in the warm summer months. It welcomes visitors for interactive play within the water as the edgeless shallow pool maintains a 3cm depth facilitating easy and safe play. Synchronized water columns as well as fog emitters add to the ambiance of the fountain plaza and create atmospherics in each season. The pool is designed so it can be quickly drained for the winter months or to open the plaza for large events. 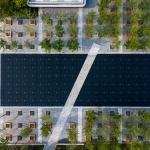 With a limited soil dept above the garage, the plaza and interactive reflecting pool was a conscientious design initiative that resulted in the most popular destination within the park. Reconnecting People and Nature: The site has undergone a complete transformation since its inception. 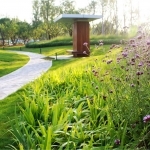 The designers have created a lush green, sustainable ecosystem. The land has become a vibrant garden teeming with plant life. Visitors can now easily enjoy the park’s large areas of dense plants, grassland, lakes, and other natural features. 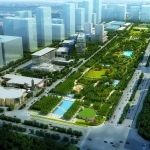 Of the park’s 205,000 square-meter area, 150,000 sq.meter have been dedicated to ecosystem restoration. 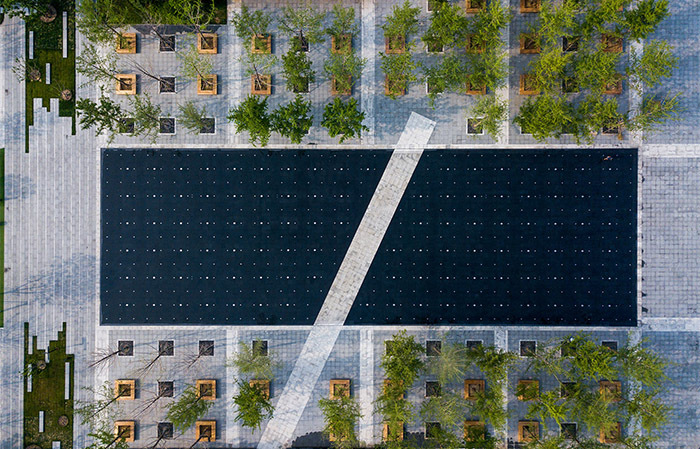 A 9:1 softscape-to-hardscape ratio, including 10,000 sq.meter of open grasslands with native plantings and 3,500 sq.meter of lakes contributes to this new ecosystem, making this site feel natural. 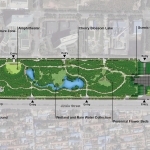 The park’s design is intentionally concave to facilitate storm water management on site, allowing rain water to collect through designated waterways, thus contributing to ecological and environmental protection initiatives.Wetlands and rain gardens allow the park to collect storm water from the surrounding area into a retention pond where it is filtered of pollutants. These features define sustainable development as a central achievement of the project. 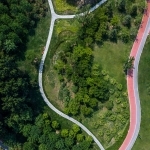 The park and trail design provides a clear example of natural processes in an urban setting. Bio-swales, rain gardens, preserved exiting trees, restored habitat, trails and plazas were all carefully sited for maximum function, but can be easily assessed or observed by community residents, stepping stones and bridges. 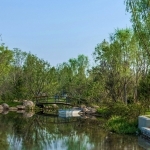 The educational aspect of the park was approached by creating a large 30,000 m2 arboretum centered at Cherry Blossom Lake, providing environmental education for visitors. Groves of trees, ground covers, and aquatic plants combine to create a lively and engaging display of the park’s habitat and natural environment. Graphic illustrations of the on-site storm water management practices are displayed to inform visitors of the importance of sustainable design within an urban setting. 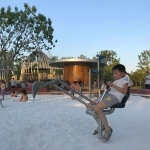 Interactive and inventive play spaces for children also contribute to the educational aspect of the park as well as encourage physical activity. 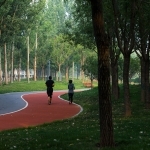 Gu’an Central Park features an expansive exercise loop that combines a leisurely walking path adjacent to a designated running track. 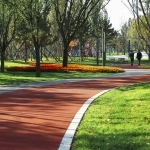 The multi-experience jogging path features a CultureRun, Shade Run, Sunshine Run, and Flower Run. These different themed experiences merge as one and make their way around the park. 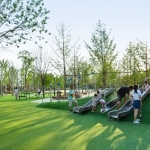 A modern park within Gu’an required the ability of connectivity, so the park offers five WIFI pavilions, creating a smart and energizing space for visitors to connect. Visitors can also recharge devices using camouflaged outdoor outlets and use the built-in technology to learn about the park’s many amenities.